Air Pollution! Water pollution! Traffic Horrors! Impact on Wildlife! Noise! There is no positive reason to allow a quarry of this magnitude to be developed in this area. It will be of no benefit to area residents nor to any of the cottagers or tourists who frequent this area. The carnage it will have on the environment will be irreparable. Despite claims by the proponents and their paid advisors, no one person can be sure that this pit and quarry will not have significant environmental impact on the water quality of Skeleton Lake. Shouldn’t our goal be to try to preserve this unique area for generations to come so that they can interact with nature, recreation, and history in a positive way. Our ancestors had the foresight to classify this area as environmentally sensitive. That is the way it should remain. Personally, we have owned property on Long Point Road, Skeleton Lake since 1952. Our cottage , built in 1979, is on a small, shallow bay. The stream that feeds into this bay has its beginnings at the proposed quarry site. Any pollutants-airborne or by water- from this site will have detrimental effects on the water of this bay, and the fish , turtles, ducks, herons , loons and the people who make their home here. In addition, given the expected increase in the massive trucks using Muskoka Road3, we will cease to be able to enjoy the peace and quiet. Already, the sound of traffic is clearly heard as the vehicles contend with the hills on the road directly across the bay. What happens when you have an extra 100 trucks a day? This proposed quarry (less than 2 km distance) will not be just gravel pit but a quarry where there will be blasting of bedrock that will make the ground shutter and the non-stop noise of huge machines grinding it into small pieces. The proposal states that this operation will be seven days a week from May to November for the next 50+ years. For over 60 years , we have paid mega taxes to enjoy our cottage and property. Is it going to be destroyed by greed and lack of empathy for our environmental gifts? The proponents of the Lippa Quarry would be transporting their material on Muskoka Road 3 going west through Rosseau and 21 km east towards Huntsville. This is a two way road with curves, hills , blind corners , hidden driveways and gravel shoulders. Large trucks ride the yellow line . It is intimidating for any drivers let alone seniors to continually meet these deadly machines. This road is classified as a “scenic” route. Who will have time to look at the scenery? Situated about halfway between the pit and Huntsville is the Aspdin Community Centre-originally S.S.# 2 built in 1893. It is a central gathering place for dinners, potlucks, social events, weekly card parties, senior groups, programs for children etc. When large trucks pass , the building rattles making it impossible to hear. What happens when there is a constant flow of huge trucks passing? The economic gains of one company should not be allowed to cause permanent harm to residents , wildlife and the local tourism industry which has flourished here for decades. This is tourist country not mining country. We live close to the proposed quarry site in a modest house living a simple life. How will this quarry impact our quality of life, our health and well being? What is the human cost to the many families living nearby? I do not want health problems from breathing silica dust. I do not want my house shaking and damaged by the blasting. I do not want the animals to disappear. I do not want my well water poisoned. I do not want my peace disturbed by the constant rumbling of gravel trucks by my door. Perhaps the people who want to build these quarries should be made to live next door to one and experience firsthand the devastating impact it would have. Thank you to John Lorinc for writing an excellent article about the fight to stop the development of a quarry near Skeleton Lake, Muskoka. I just want to elaborate on several of the issues that Mr Lorinc identified in his piece. My grandfather, Harry Newman, built a cottage on the north shore of Skeleton Lake in 1934, and members of my extended family have been cottaging there ever since. I personally have been visiting this area for more than sixty years, and in this time have seen many changes. While the water still appears to be exceptionally clear, large blooms of algae have become increasingly common in recent years. A significant increase in phosphorous levels if the quarry goes ahead, as predicted by Gord Miller, would cause this algae problem to escalate rapidly, and to get out of control. Muskoka Road 3, is proposed as the principal haulage route for the trucks from the quarry, and it runs within 100 metres of the shoreline at Newman’s Bay, where the trucks must climb a steep hill. Truck noise is already a serious problem for permanent residents and cottagers in this area, and the sound travels unimpeded across the lake, and can be heard clearly by cottagers on the southern shore. Muskoka Road 3 is also designated as a Scenic Corridor in the Official Plan of the Township of Muskoka Lakes. It is a popular route for tourists in cars and buses, on motorcycles, on bicycles, and on foot. The proposed quarry would increase traffic by over 100 trucks per day during the height of the tourist season, a recipe for disaster. Tourism is a sustainable industry that creates jobs and wealth in Muskoka, and this quarry proposal has very little upside, and a whole lot of downside. Imagine a postcard perfect Ontario wilderness lake in front of you. You can drink the water, loons call and swim by in the early morning. How is it possible that one could be so lucky to enjoy such a place, and it still exists? Then a ten or twenty ton gravel truck rumbles down the road behind you, a road categorised as a scenic route through what Muskoka Tourism says is “consistently named as one of the best places to visit in Canada and the world by publications such as National Geographic, Frommer’s and Reader’s Digest. Discover what makes Muskoka so amazing.” Those trucks are already rolling by every day, but for now mostly for a few peak hours in the mornings and evenings, less frequently on the weekends. The proposed quarry near Skeleton Lake would turn up the volume to a constant flow seven days a week, dawn to dusk and beyond. Traffic noise levels now exceed 80 decibels while sitting on the shore. Unfortunately, planners with a lack of foresight never imagined trucks using this scenic route as a shortcut between highway 11 and 400 and placed the road extremely close to Skeleton Lake on the north side. It passes less than 100 feet from many dwellings and the lake. Now they risk making the same mistake again. More than 100 trucks a day could be rumbling by. I don’t think the loons would like that. It might be a bit difficult to discover what makes Muskoka so amazing once phosphorous and mercury levels rise and pollute first Skeleton Lake and then Lakes Muskoka and Rousseau. Oh, but you might never get near the water as the noise and dust from the gravel trucks would scare you (and the loons) away. I thank you for your excellent article and putting a spotlight on this issue. On June 16th at Port Carling, Mr. Frank Lippa, applied to the council of the Township of Muskoka Lakes for permission to open a rock/gravel quarry and pit on Butler Mill Road. This operation would take 200 000 tonnes of material out of the pit annually. This application was unanimously turned down in an open vote by the council of the Township of Muskoka Lakes. Mr. Lippa has applied to go to the Ontario Municipal Board to request that his application for the pit and quarry be accepted as is. If this application is accepted by the OMB, that would mean more than 100 heavy gravel trucks a day would travel on Aspdin Road, (one every 4 1/2 minutes). Some of them would be going east to Huntsville, some would be going west to Rosseau. There are so many reasons why this application should be turned down. 1. A major concern is for the safety of vehicles, pedestrian and bicyclers on the roads. Heavy gravel trucks are not able to stop on a dime. School buses that are stopped on the road would not have a chance if a gravel truck came around a corner and was not able to stop. There are already a huge number of heavy trucks using this road on a daily basis, such as logging trucks, Muskoka Containerized Services trucks, Panolam trucks, Hutcheson Sand and and Gravel pit trucks, to name a few that use this road. Aspdin Road is not a provincial road and was not built for such heavy traffic. An extra 100 trucks a day would wreak havoc with the road, with visitors, with residents and with the wild life. Not acceptable. 2. Residents, through their taxes, would have to foot the bill for repairs to the road and would have to live with the dangers of living on a road with such heavy truck traffic. Not acceptable. 3. Another major concern is that this pit will be operating below the water table. The water and the pollution from that operation will flow into Skeleton Lake and then on to Lakes Rosseau, Muskoka and Joe. This is simply not acceptable. 4. It is the belief of the directors of the Rosseau Farmers’ Market that this amount of heavy truck traffic will pose a serious risk to pedestrians in the village of Rosseau. The major economic engine in Muskoka is tourism. Rosseau Farmers’ Market draws an average of 3000 visitors on market days. The market is located on Highway 141, which is one of the roads that those huge gravel trucks would use. As it is, Rosseau has very heavy traffic congestion on market days. It is our belief that additional heavy truck traffic would result in accidents and deaths. We very strongly urge the Ontario Municipal Board lakes to deny this application. The directors of the Rosseau Farmers’ Market. With 2018 underway, I wanted to send you an update on the actions the SLCO Board and our lawyer, David Donnelly, have taken with respect to opposing the proposed Lippa pit and quarry. We have retained a number of experts to help us prepare our case for the OMB hearing. We have already received a preliminary report from a traffic safety expert, who has identified a number of issues that would arise on Aspdin Road as a result of the heavy truck traffic that would be generated by the quarry operations. We are also meeting this week with David Pink, Director of Planning for the Township of Muskoka Lakes. As you know, Township Council unanimously rejected Lippa’s re-zoning application for the quarry, and we are working with David to co-ordinate our opposition. A reminder that a pre-hearing conference will be held on Wednesday, February 21, 2018. The purpose of this conference is to determine the issues, parties, and participants prior to the actual Ontario Municipal Board (OMB) hearing, which is expected to take place later this year or early 2019. As David has advised, a strong turnout from residents and cottagers who are opposed to the proposed pit and quarry is important at the pre-hearing conference. Thus, please mark Wednesday, February 21, at 10:00 am at the Township of Muskoka Lakes Council Chambers in Port Carling on your calendar, and plan to attend if possible. In the interim, we encourage all members to go to the SMP website (stopmuskokapit.ca) and sign the petition opposing the Lippa quarry. The petition represents the voice of many in the community. There are now almost 2,000 signatures on it! As communicated last month, SLCO has sufficient funds to meet both the legal and expert costs it is currently incurring, up until the pre-hearing conference. However, substantial additional monies will be required if we are to succeed at the subsequent OMB hearing. Our intention is to launch a fundraising effort over the next few months. We will continue to keep you informed on this important issue. We appreciate your ongoing support as we work hard to keep Skeleton Lake the special place we all enjoy. As many of you are aware, SLCO and the “Stop Muskoka Pit” group have been working together to oppose a 200,000 tonne/year pit and quarry that Frank Lippa is proposing to develop at a site 1.7 km from Skeleton Lake. 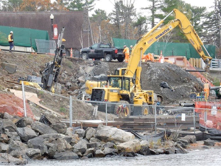 In June of this year, the Township of Muskoka Lakes Council voted unanimously to deny Mr. Lippa’s rezoning application, in response to concerns raised about the impaired water quality, noise, and traffic that would result from such an operation. Mr. Lippa subsequently filed an appeal to the Ontario Municipal Board (OMB). In response, SLCO has retained external counsel (David Donnelly) and various experts to assist us in opposing Mr. Lippa’s appeal. Last week, we received some new information about the OMB Lippa appeal hearing. Specifically, a pre-hearing conference will be held on Wednesday, February 21. The purpose of this conference is to determine the issues, parties, and participants prior to the actual OMB hearing, which is expected to take place next summer. As David advises, a strong turnout from residents and cottagers who are opposed to the proposed quarry will be important at the pre-hearing conference. Thus, please mark Wednesday, February 21, 10:00 am at the Township of Muskoka Lakes Council Chambers in Port Carling on your calendar, and plan to attend if possible. Fortunately, SLCO has sufficient funds on hand to meet the legal and expert costs it is incurring, up until the pre-hearing conference. However, substantial additional monies will be needed if we are to mount a successful opposition at the subsequent OMB hearing. Our intention is to launch a significant fundraising effort in the New Year. We will continue to keep you informed on this matter, and are confident of your ongoing support as we fight to maintain the pristine water, along with the peace and quiet, that are so central to our enjoyment of Skeleton Lake. The following letter was submitted by Cathy Malcolmson who was kind enough to share her support for our cause and offer some advice from the “Save the Bala Falls” campaign. It is so impressive that your community has taken the stand to oppose the proposed quarry at Skeleton Lake. I believe we all have a responsibility to protect our Muskoka environment and ensure development doesn’t occur in locations that will negatively impact our ecosystem. Over the past 11 years I have been involved supporting Save The Bala Falls in trying to stop the development of the Hydro Generating plant at the Bala Falls. Our community rallied together to stop this plant and it was very disheartening to see construction trucks roll into Bala in August. We fought hard, and continue to do so, but I wonder if we would have had a different outcome if the urgency we felt in 2016 had of been the same in 2006. Many people felt the plant would never be built as common sense would prevail. That doesn’t seem to have been the case. Because of being such a small community, we needed every voice to be heard and we needed everyone to be loud. Every signature, letter, telephone call and dollar helps. We wanted everyone in the community to take a vested interest, and take action to stop the generating plant. That truly does take all residents – permanent or seasonal, and every friend you can acquire from outside the community. Our community activities were developed over time. If all of these had been implemented from the start, it may have caused a better outcome. Call on the community to share their expertise – engineering, environmental expertise, legal, public relations, government contacts, public speaking, and fund raising. Send letters, sign petitions and make phone calls. Consider hosting fund raising events, running public awareness booths and selling merchandise such as T-shirts. Car stickers and lawn signs at home will help to bring awareness outside the community. I hope your community is successful in stopping this quarry. All the best!